Ironing the inner voice.com way! So you want to see what was used to iron pre electric irons? If you hate ironing now, think on our fore parents? All the preparation and effort put forth to rid clothes and linen of wrinkles. It was washing and drying one day and ironing the next! This cast iron smoothing iron is small but very heavy, so it was hot and heavy and a task which required a bit of skill. Organization and good technique were required to make any serious progress and avoid all the heat. But I guess it was better than wearing wrinkled clothes? This kind of iron would have been heated by putting coal in a metal bucket and making a fire in the bucket. Once the coal was burning, you sat the iron down on the hot coals to heat. When properly heated, you removed the iron, run it over a rag and then a piece cedar to test how hot it was. If it burned the cedar, you had better let it cool before proceeding. 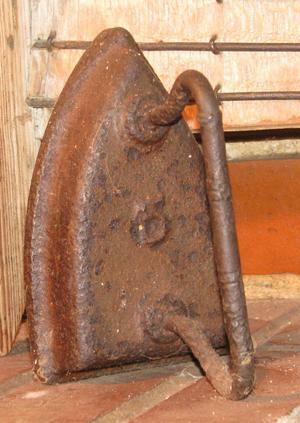 Now, you had to make sure the iron was free of coal dust and cedar sap. Though its primary use was for ironing, it could just as well be used for,,,YOU KNOW! Now we have electric irons and too many clothes.